The Carbon Expo 2012 is a leading international trade fair and knowledge-sharing platform for carbon investments, and clean technologies. This event brought together project developers, service providers, buyers and sellers of carbon credits, and other public and private stakeholders. The Carbon Expo presented Belize with an opportunity to showcase Belize as an attractive destination for CDM projects and the voluntary carbon market. 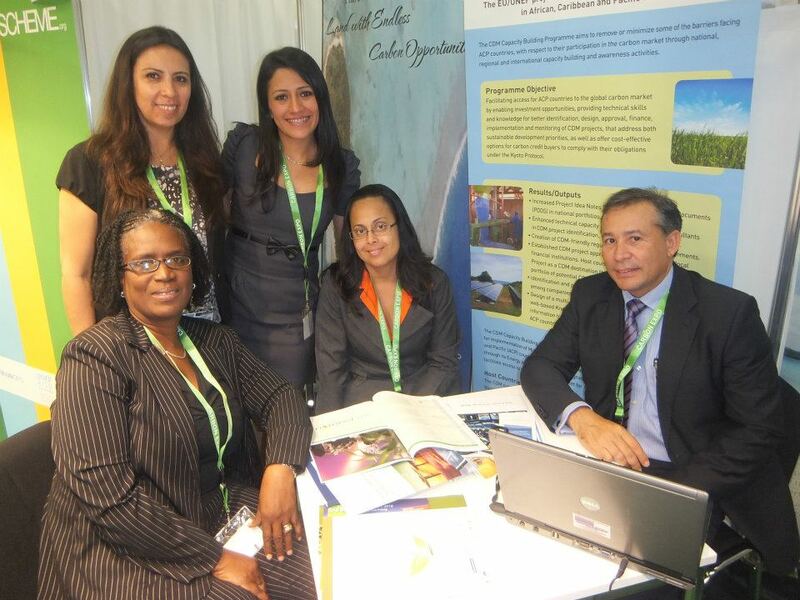 In addition to showcasing Belize, Carbon Expo 2012 provided the country with the opportunity to attract carbon finance to develop climate-friendly projects and to encourage the transfer of cutting edge technologies and know-how. Belize has huge potential for carbon market projects that provide sustainable development benefits. These projects range from renewable energy, to solid waste, landfill recovery, to reducing emissions from deforestation and forest degradation. To date the Caribbean accounts for less than 1 percent of the more than 4, 000 CDM projects registered in more than 70 countries. Belize’s participation was made possible under a Clean Development Mechanism Capacity Building Programme which falls under the umbrella of a UNEP- European Union cooperation activity on “Capacity Building related to Multilateral Environment Agreements in Africa, Caribbean and Pacific (ACP) countries”. In May of 2011, Belize formally established the first DNA, which now allows for a formal certification program for Carbon Offset projects in Belize. Parallel to this, BELTRAIDE was designed as the entity that will market projects in Belize. In this vein, several workshops have been conducted to encourage investment in projects with carbon credit potential, and to teach investors how to prepare their project to make them compliant under the CDM process. At the Expo, Belize had the opportunity to set up a booth to greet policy makers and potential investors in Carbon Offset projects. This booth was set up as part of the ACP display, and we shared space with Africa, the South Pacific and the Caribbean. Since Belize and Cuba were the only two Caribbean countries represented, Belize had a very prominent place in the display. The Expo allowed Belize to provide information on a number of high potential projects to a wide variety of investors. With assistance from the Director of Energy Investments, Mr. John Mencias, we were able to present a very good summary of potential projects in a format that was easy to present. Additionally, one private sector group led by Mr. Glen Eiley attended the Expo to seek funding for a proposed Ethanol project. The majority of attendees at the Expo were brokers seeking trading ready projects, and with interest in either listing project for sale, or for outright purchase. Other attendees included consulting firms that assist project developers in bringing their projects to the approval phase, and eventually to market. The other group of attendees, which were of most interest to Belize, was the national representatives of governments that fund projects or that invest directly on a bilateral basis in Carbon Offset projects in developing countries. The overriding sentiment at the Expo was from European entities that recognize the impending withdrawal of the EU from the forefront of carbon offset trading under the CDM Mechanism. Without a doubt we still have uncertainty with regard to the future of CDM post Dec 2012. And it all comes down to demand. If there’s no demand for the resultant credits from CDM projects then there’s no CDM. Investors need confidence that they will get a return on their investment and at the moment there’s little to give them that confidence. Belize’s space in this trading market is very limited because our carbon footprint is considered to be very minute compared to larger emitters. What this means is that our baseline have very little change potential, and therefore very small opportunities for offsets to be realized. This means that we struggle to identify meaningful projects with offset potential. With our large forest reserves and our relatively good forestry practices, the opportunity for REDD+ projects is positive, however these mechanisms are ill defined and any benefits are subject to massive bureaucracy and to stringent development constraints. Development of projects through direct project financing and certification of credits for trading. There are several commercial sources for funding by banks and other lending institutions in the developed world that see opportunity for “banking” of carbon credits. Bilateral arrangements with donor countries to sponsor specific clean development projects in Belize, including carbon sink projects. Supplier financing for projects using EXIM mechanisms in origin countries. Financing of carbon offset projects by multilateral lending institutions (IDB, World Bank, etc.) using specific carbon funds allocated by member countries. Great potential for projects that promote afforestation of savannah areas and degraded lands. Belize should continue its efforts to develop projects that will qualify for carbon credit trading, following the guidelines established by the CDM programme, and certified by our now-established DNA. Qualified projects should be packaged and presented to various potential financing and donor entities as national priorities. The office in Belize responsible for carbon offset projects needs to be established at a more senior level. Ms. Gordon represents Belize at a very high level, yet carries only a title of Scientific Officer in the Ministry. This role should be designed as Director of Climate Change. The establishment of a forest or stand of trees in an area where there was no forest. Hi Administrator- Good information on Trade Show Displays… Also, Wanted to grab the RSS feed but I could not. Would you mind sending the link to me, or posting it here? Thank you for your comment and feedback. We do appreciate collaboration in sharing the information that is generally beneficial for our public.